Get ready to ride back in time to the America of the 50's. Here's a nice, historical 6 minute video hosted by the National Association of Manufacturers (NAM) which documented how the Columbia line of bicycles ("bringing health and pleasure to millions of Americans") were produced. West Field Manufacturing, at West Field Massachusetts, was the first company to produce an American bicycle (Columbia highwheel) The video shows how ribbons of steel were seamlessly welded into tubes of various diameters and then cut and shaped to assemble frames, how handlebars were chrome plated, how spokes were connected to the rims and trued as well as glimpses of other cutting operations to yield chain rings and cogs, all over pleasant, soaring music and a serious, hurried narrator. To see the video, go to the NAM host page here and hit "Click to View". If you're interested in knowing more about vintage Columbia bicycles, click this page. 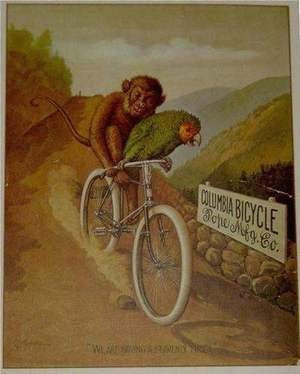 Check out this old Columbia poster, originally published in 1895 - found on Ebay. Pretty funny. I guess it was hard then to substitute humans for animals.. Why is this monkey riding with a parrot, and why is this lazy parrot not flying? Was Columbia for monkeys and parrots? I.. I really can't explain this picture. Climb like a monkey, descend like a, uh, parrot? Not completely sure either what they were trying to say in the poster. I am currently reading what must be the only book that seems to exist on Col. Albert Pope, by Stephen Goddard, and it is quite interesting. Col. Pope started manufacturing Columbia bicycles in 1876, and you can see the reference to Pope Manufacturing on the poster, so I am not sure who Westfield is or was. It could have been a subsidiary of Pope Mfg; he began near Boston, but as he became more successful he relocated his operations in Hartford, Connecticut. Of course, then he went to the Dark Side, like Edoardo Bianchi, and started building automobiles and the rest was a disaster. Could be. I only wrote what I saw in the NAM video. I believe they made reference to the first American high wheeler being made back in the late 1800's, but it doesn't specifically mention that Westfield was involved. Maybe they were partners. Certainly, this kind of promotional media is strange, but back then could have been the norm. This makes me want to dig into how other commodities were advertised during those times.